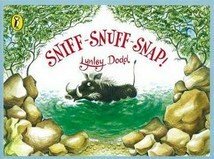 Lynley Dodd Review: 'Sniff Snuff Snap' is the tale of a very grumpy and short tempered warthog who is very territorial about his waterhole. And he has good reason. Over the course of the story his little waterhole - 'green and brown' - is visited by increasingly large numbers of animals. Eventually the inevitable happens, the warthog returns to the waterhole one day 'tired and hot' to discover, to his dismay, that all that remains of his waterhole is 'thick brown mud.' But all is not lost. In the background a storm is brewing, and the first large raindrops begin to spatter down on the very last panel. As readers, we can safely assume that the warthog's little waterhole will soon again be brimming with fresh water. There are a number of African animals who visit the warthog's waterhole, and 'who always sneak back,' when the warthog is not looking. As with all Lynley Dodd books there is a large amount of humour in this story. We can feel and see the warthog's growing frustration and fury as animals continue to drink from his waterhole. There is much to like about Sniff Snuff Snap. Key moments of the rhymed text are repeated. This technique allows young children to practice the rhyming language, over and over. As a clinician, I find that the repeated verses allow predictability for children reading the story. Young children also enjoy the illustrations, which are life like, but also have a cartoon feel to them. Sniff Snuff Snap offers several, possible extension activities. The story gives a brief snapshot of life on the African plains and mentions many different types of animals. One extension activity would be to examine the different seasons in Africa and discuss with children how important the rainy season and water are to all the wildlife.